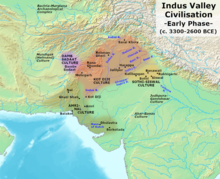 The Indus Valley Civilisation (IVC) was a Bronze Age civilisation in the northwestern regions of the Indian subcontinent, lasting from 3300 BCE to 1300 BCE, and in mature form from 2600 BCE to 1900 BCE. 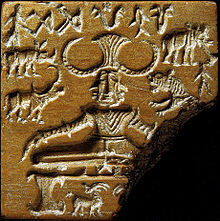 [note 1] Along with ancient Egypt and Mesopotamia it was one of three early civilisations of the region comprising North Africa, West Asia and South Asia, and of the three, the most widespread, its sites spanning an area stretching from northeast Afghanistan, through much of Pakistan, and into western- and northwestern India. 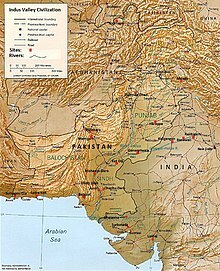 [note 2] It flourished in the basins of the Indus River, which flows through the length of Pakistan, and along a system of perennial, mostly monsoon-fed, rivers that once coursed in the vicinity of the seasonal Ghaggar-Hakra river in northwest India and eastern Pakistan. 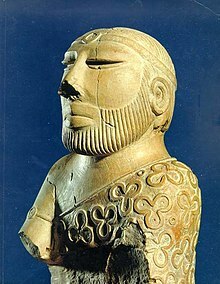 Mehrgarh is a Neolithic (7000 BCE to c. 2500 BCE) site to the west of the Indus River valley near the Bolan Pass, which gave new insights on the emergence of the Indus Valley Civilization. 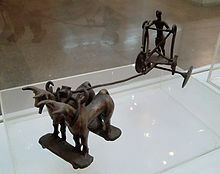 [note 26] Mehrgarh is one of the earliest sites with evidence of farming and herding in South Asia. [note 27] Mehrgarh was influenced by the Near Eastern Neolithic, with similarities between "domesticated wheat varieties, early phases of farming, pottery, other archaeological artefacts, some domesticated plants and herd animals. 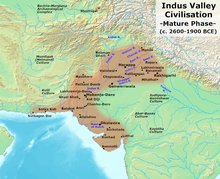 "[note 28] According to Parpola, the culture migrated into the Indus Valley and became the Indus Valley Civilisation. Jean-Francois Jarrige argues for an independent origin of Mehrgarh. Jarrige notes "the assumption that farming economy was introduced full-fledged from Near-East to South Asia,"[note 28] and the similarities between Neolithic sites from eastern Mesopotamia and the western Indus valley, which are evidence of a "cultural continuum" between those sites. But given the originality of Mehrgarh, Jarrige concludes that Mehrgarh has an earlier local background," and is not a "'backwater' of the Neolithic culture of the Near East." A rare etched carnelian bead found in Egypt, thought to have been imported from the Indus Valley Civilisation through Mesopotamia. Excavated in Abydos, tomb 197, Late Middle Kingdom of Egypt. London, Petrie Museum of Egyptian Archaeology, ref. UC30334.